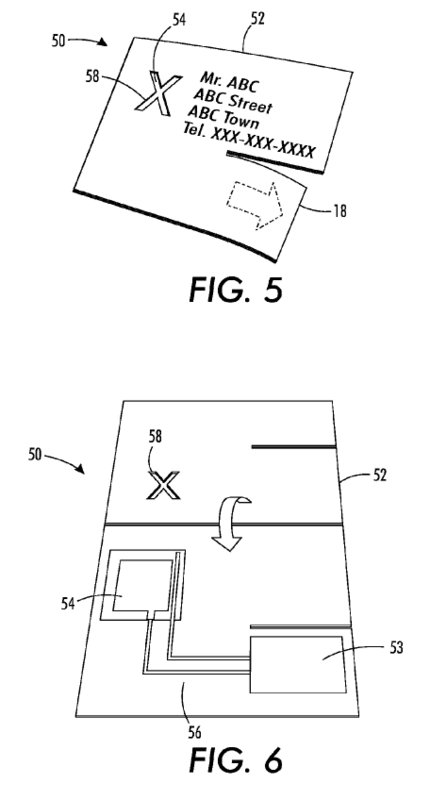 I came across a recently granted patent that describes a printed card such as a business card with a display that is powered by a built-in piezo power source. This is a neat printed electronics application that gets around the problem of needing a battery to operate any device such as an indicator or display printed on the substrate. Although there are “printed electronics” batteries they tend to require encapsulated electrolytes to fabricate them and so are not entirely compatible with low-cost printing processes. An interactive card or the like employs a piezoelectric charge generator (piezo-strip) for temporarily driving an indicator. The piezo-strip may be displaced (bent) in order to generate charge to drive the indicator. Printed electronic processes are utilized to produce the indicator and/or the piezoelectric charge generator. An indicator is formed on a substrate by way of a printed electronics process. A displaceable region of piezoelectric material associated with the said substrate is formed by way of a printed electronics process. Electrical interconnections are formed on said substrate by way of a printed electronics process. The electrical interconnections connecting said indicator and said first region of piezoelectric material such that displacement of said first region of piezoelectric material generates a voltage therein that is provided to said indicator in order to actuate said indicator and thereby indicate the displacement of said first region of piezoelectric material. The drawings give a pretty good idea of the invention and its construction. I’ve reproduced two sets of figures below to show this but there are more in the patent that you can view. FIG. 1 is an illustration of a display-capable business card with piezo-strip according to an embodiment of the present disclosure. FIG. 2 is an illustration of the display-capable business card with piezo-strip according to FIG. 1, showing the deflection of the piezo-strip and the resulting actuation of an indicator. FIG. 5 is a photograph of a display-capable business card with piezo-strip and template over an indicator according to another embodiment of the present disclosure. FIG. 6 is a photograph of the components of the display-capable business card with piezo-strip and template over an indicator shown in FIG. 5. 1. A method of forming an interactive card with indicator on a substrate, comprising: forming said indicator on said substrate by way of a printed electronics process; forming a displaceable region of piezoelectric material associated with said substrate by way of a printed electronics process; forming electrical interconnections on said substrate connecting said indicator and said first region of piezoelectric material such that displacement of said first region of piezoelectric material generates a voltage therein that is provided to said indicator in order to actuate said indicator and thereby indicate the displacement of said first region of piezoelectric material, said electrical interconnections formed by way of a printed electronics process, wherein said first region of piezoelectric material is formed over a piezo-strip region of said substrate; and partially disconnecting said piezo-strip region from said substrate in order to permit displacement of said piezo-strip region independently from the remainder of said substrate. Piezo technology does offer quite a few opportunities for where a brief amount of power is required to trigger a device. This patent describes one use illustrated above but also extends the ideas to other applications such as switches or sensors that can indicate if vibration or bending has happened. Another application detects liquid levels by sensing where the liquid moves a series of vertical flaps on the sensor by its swirling action. I have not seen any commercial applications of this but am aware of a Swiss company that uses the piezo effect to produce a keyboard and they recently demonstrated this integrated with one of Plastic Logic’s electrophoretic displays (see here). For some time I have been watching technology developments towards colour e-reader displays which can handle rapid refresh rates for good video performance and also have a long battery life and there are some promising breakthroughs already described in this blog by Liquavista and E-ink. I was interested to read recently of Korean’s largest bookseller, Kyobo, introducing a colour e-reader featuring Qualcomm’s Mirasol display technology. This is the first time an e-reader has featured the mirasol technology. The Mirasol approach essentially mimics nature’s way of producing colour. For example the blue colour in butterfly wings is created by an interference effect caused by the photonic crystal nature of their scales. The microstructure of the scales causes light to be coherently scattered. In a similar way the mirasol technology uses an array of interferometric modulators (IMODs) so that light is either absorbed or reflected and depending on the state of the modulator it can be reflected as red, green or blue light. 1. A device comprising: a substrate; a fixed reflector; a movable reflector comprising an electrically conductive material, wherein an interferometric cavity is defined between the movable reflector and the fixed reflector, the movable reflector being movable between at least a first position, a second position, and a third position; and a spacing layer positioned on a side of the fixed reflector that is opposite from the movable reflector, wherein the spacing layer is positioned between the fixed reflector and the substrate, wherein the spacing layer provides a filtering cavity configured to improve color saturation of light reflected by the interferometric cavity. Figure 10 from the patent illustrates how a tri-state modulator has been constructed with spacer layers to provide the building blocks for the colour display. The blue modulator has three states. In the first state, the movable reflector 14 is at a first position, for example, position 81, and the blue modulator substantially reflects white light. In the second state, the movable reflector 14 is at a second position, for example, position 82, and the blue modulator substantially reflects no light. In the third state, the movable reflector 14 is at a third position, for example, position 83, and the blue modulator substantially reflects blue light. The spacing layer 103 increases the distance between the movable reflector 14 and the conductive layer 102 and therefore decreases the capacitance between the movable reflector 14 and the conductive layer 102 and provides adequate protection against shorting between the movable reflector 14 and the conductive layer 102. At the same time, the spacing layer 103 defines a second interferometric modulating cavity between the fixed reflector 16 and the conductive layer 102. The thickness and composition (index of refraction) of the spacing layer 103 can be adjusted to vary the effective optical path length of the second interferometric modulating cavity to produce a desired color filter. For example, the spacing layer 103 may be adjusted so that the second interferometric modulating cavity acts as red, green or blue band pass filters as desired, and therefore the multi-state interferometric modulator 12 reflects saturated red, green or blue light. Full details of the approach are covered in the patent including the colour gamut response for such a device. The other attractive features of the mirasol display are that the refresh rate for the display is extremely fast (microseconds rather than milliseconds) so that video with no motion blur is possible. The display also works in a bi-stable mode which allows for near-zero power usage in situations where the display image is unchanged. 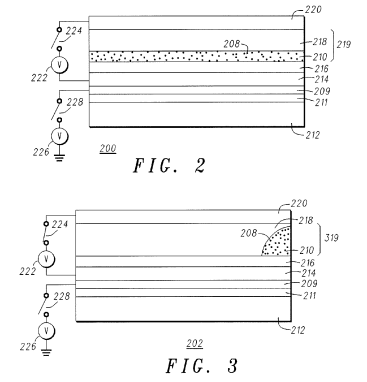 There are many patents now granted in the Mirasol portfolio and I have just picked out one of the recent ones. Contact me if you are interested in details of any of the earlier granted patents. Electrowetting display technology – Liquavista now owned by Samsung. Samsung’s recent acquisition of Liquavista (19/01/2011) is a significant step and indicates that the LCD giant is recognising that there are new technologies that will compete effectively with LCD for video colour displays. Liquavista were founded in 2006 as a spin-out from the Philips Research Labs and offer a new type of electronic display technology known as electrowetting for applications in e-readers, mobile phones, media players and other mobile devices. Electrowetting has been known for a while and is very effective in E-paper displays such as those used in the Amazon Kindle. These are black and white and so far there is no colour version available. Liquavista has been working away at this and believe they have cracked the problem with their latest technology. I thought it would be useful to see what patents had been granted to Liquavista. A quick search reveals that there are many applications in the pipeline but relatively few of these have been granted. 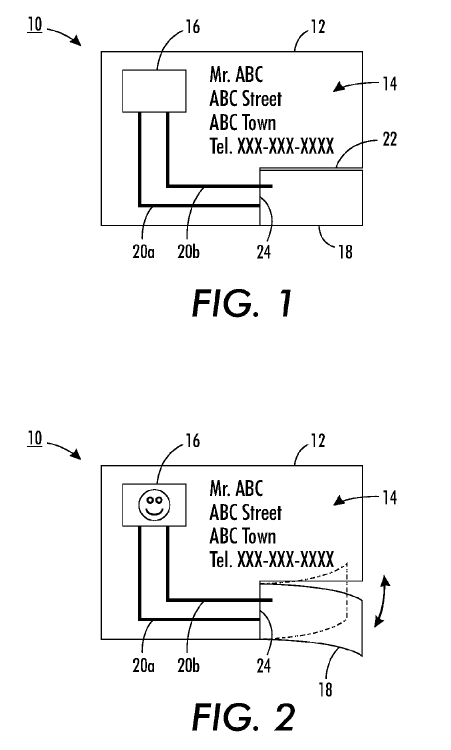 The most recent is US7800816 and is entitled: Display Device Based on Electrowetting Effect. It was granted on 21/09/2010 and was no doubt an important consideration in Samsung’s decision. 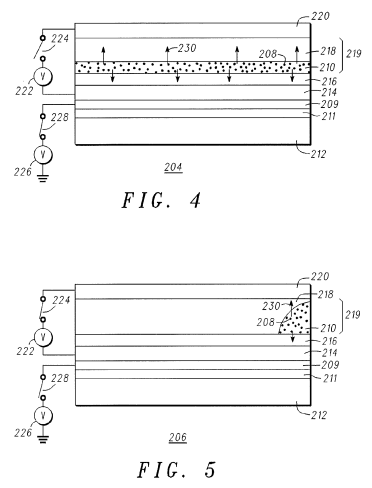 The patent provides a technical description of the electrowetting effect and describes how this can be incorporated into a device for either reflective or transmissive displays. Figure 1 shows an individual display pixel or cell; in Figure 1a the cell is shown with no voltage applied – the display cell (which contains two immiscible fluids – one a black oil and the other a clear aqueous based fluid) does not reflect or transmit light as the oil is spread over the whole area of the cell. Figure 1b shows the state when a voltage is applied – here the black oil has moved aside due to electrostatic forces and light can be reflected or transmited. By using a matrix of these pixels it is possible to create a display. The illustration uses a black oil but by using different dyes it is possible to create coloured oils for colour displays. A full explanation of this technology is given in the white paper provided by Liquavista (note: this is a large file and may take a while to open). 1. An optical switch comprising at least one first fluid (5) and a second fluid (6) immiscible with each other within a space between a first transparent support plate (3) and a second support plate (4), the second fluid being electroconductive or polar, the first fluid being an oil comprising a dye, the concentration of the dye being at most 0.2 M (mol/L). 2. An optical switch according to claim 1, the concentration of the dye being at most 0.1 M.
3. An optical switch according to claim 1, the concentration of the dye being at least 0.01 M.
4. An optical switch according to claim 1 in which the oil comprises at least one of the group silicone oil, hydrocarbon oil or fluorocarbon oil. 5. An optical switch according to claim 1 in which the first fluid has a Figure of Merit (FoM=ε.C) of at least 102 cm−1 in which ε is the extinction coefficient of the dye and C is the concentration of the dissolved dye in the first fluid. 6. A display device comprising picture elements having at least one first fluid and a second fluid immiscible with each other within a space between a first transparent support plate and a second support plate, the second fluid being electroconductive or polar, a picture element having an optical switch according to claim 1. Hopefully this brief overview will provide some background to electrowetting and the value of patents in determining strategic business direction and success. NovaCentrix, a leader in printed electronics manufacturing technologies were recently granted an U.S. Patent 7,820,097 entitled “Electrical, Plating and Catalytic Uses of Metal Nanomaterial Compositions”. This covers in part the use of flash lamps to sinter metal-based inks and materials on low-temperature substrates such as paper and plastic and includes high-speed and roll-to-roll processing. This process is critical to the advancement of innovative new products in photovoltaics, displays, RFID, sensors, batteries, capacitors, and smart packaging. The claims are shown below and I have included the full set as they illustrate how the main broad claim 1 has been defined and the dependant claims used to expand on the materials, the substrate and the manner in which the printing process can be accomplished. 1. A method for sintering materials comprising: depositing a material on a substrate, wherein said substrate has a decomposition temperature below 450 degrees Celsius, wherein said material has at least one dimension less than 1 micrometer, wherein said material includes at least one metal; and irradiating said material on said substrate in ambient air by a flash lamp for sintering said material on said substrate, for a duration between one microsecond and one hundred milliseconds such that the conductivity of said material on said substrate increases by at least two-fold. 2. The method of claim 1, wherein said at least one metal is copper. 3. The method of claim 1, wherein said material is included within an ink formulation. 4. The method of claim 1, wherein said substrate comprises a substance selected from the group consisting of PET, polyester, polymers, resins, paper products, organic compounds, laminates, and combinations thereof. 5. The method of claim 1, wherein said depositing includes producing a film or pattern on said substrate from said material included within an ink formulation. 6. The method of claim 1, wherein said depositing further includes printing. 7. The method of claim 6, wherein said printing is selected from the group consisting of screen printing, inkjet printing, gravure, laser printing, xerographic printing, pad printing, painting, dip pen, syringe, airbrush, lithography, flexography and combinations thereof. 8. The method of claim 1, wherein said method further includes moving said substrate when said material is being irradiated by said flash lamp. 9. The method of claim 8, wherein said substrate is being moved continuously. 10. The method of claim 8, wherein said substrate is dispensed from a roll. Founded in 1993 as the result of a joint venture between Kent State University (Ohio) and Manning Ventures (Rochester NY), Kent Displays is a world leader in the research, development and manufacture of Reflex™ No Power LCDs for unique, sustainable applications including electronic skins, writing tablets, smartcards and eReaders. The technology is based upon bistable cholesteric LCD technology. In October 2008, Kent Displays installed a new roll-to-roll production line in their headquarters in Kent, Ohio, U.S.A. to mass produce Reflex LCDs from rolls of plastic. The line is the first of its kind in the world and produces no waste water/chemicals and less solvent emissions than sheet-based processes. The flexibility, durability and exceptional thinness of the plastic displays, combined with no power image retention and superior optical characteristics, result in a versatile, environmentally-friendly alternative to traditional paper and backlit LCDs – with nearly endless applications! 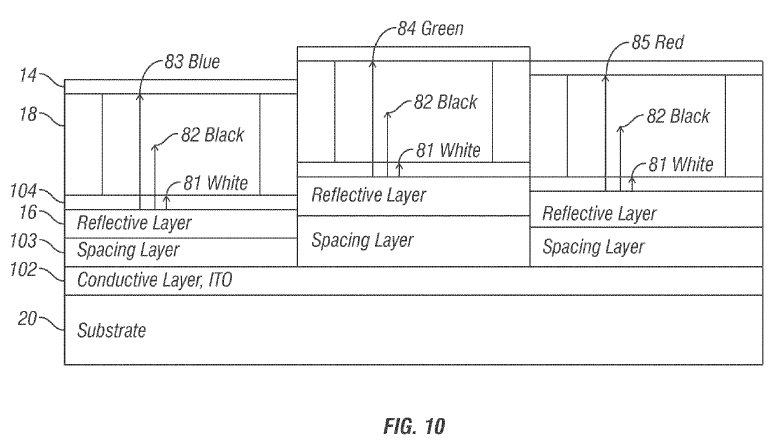 US7773064B2 was granted on 10th Aug 2010 and describes a novel concept in liquid crystal display technology: a display that is a manufactured film. The invention is a display film that is fabricated, lifted off a release liner and then transferred to any desired substrate. The display film may be fabricated by applying a plurality of layers in sequence to include all display components or can be fabricated with some components and later laminated together to complete the display device. A particular feature of this technology is that it does not need to be made on a transparent substrate making available a broader range of substrate materials such as fabrics that can be deformed by bending, rolling, draping or folding. There are 58 claims in total covering many different forms of the basic concept described in claim 1. These include laminating onto a solar panel for a self powered display; laminating onto fabrics; a multilayer film with sublayers of reflective red, green and blue for colour displays. 1. A transfer display film comprised of stacked layers that are prepared on, cured or dried and lifted from a release surface and then transferred to a substrate, wherein said stacked layers comprise at least one liquid crystal dispersion layer comprising liquid crystal material dispersed in polymer, a first electrically conductive layer located near one side of said dispersion layer, a second electrically conductive layer located near the other side of said dispersion layer and an electrical insulation layer located between and in contact with said dispersion layer and said first or second conductive layer.